Each year thousands* of people over the age of 55 are injured in the bathroom due to simple slip and falls while in the bath or using the bathroom. As the aging become more fragile or health problems and side effects from medications can increase chances of injury, there are simple additions you can make in their bathroom to reduce the risk of injuries or even death. Safety-Rails: Install grab bars by the toilet and in the shower. These need to be properly installed so they are secure enough to support weight. Also consider using shower chairs and bath benches to help avoid someone falling in the bathtub. 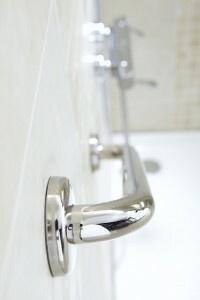 Non-Slip Strips/Mats: Avoid falls in the bath or shower by applying non-slip strips to the floor of the bathing surface. Don’t forget to purchase a non-skid mat for directly outside of the shower stall or bathtub. Lighting: Increase the wattage of bulbs in the bathroom for better visibility. Add a nightlight in the bathroom, and consider putting additional nightlights or motion lighting along the path from the bedroom to the bathroom. Raised Toilet Seat: Current toilets can either be modified with a raised toilet seat, or replaced entirely with a higher toilet. A raised toilet can be a huge improvement for older knees. These simple additions can help prevent unnecessary slip and falls. Do you have a suggestion to help keep an elderly person be safe in the bathroom, add your comment below, or join in the conversation on Facebook.